A small pharmaceutical company had a promising break through on a new medication that was sure to increase sales and take over valuable market share from larger pharmaceutical companies. However, they needed an aggressive and inventive tool to not only promote this drug but change the way medical professionals prescribed this therapeutic agent. They had tried several other promotional product ideas; including mailers with pens/post-it items attached and pre-loaded USB Flash Drives but none seem to work effectively and became outdated almost as soon as they were delivered. Provide a sales tool that will help their Sales Reps stay in front of their customers – brochures, catalogs, sell sheets, case studies and testimonials. Incentivize the medical professionals to learn about this new drug – from product benefits, risks and potential side effects. Once they found out about the iCue technology and capabilities, they knew immediately this was what they were looking for and how they were going to place it in their strategic marketing plan. 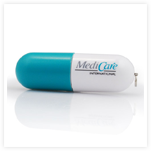 They placed an order for 5,000 units in the shape of a pill and imprinted with the company name, drug name and website. They placed the iCue in a small clear pouch with an insert card that read, “Plug in to Win – your new iPad2!” When the medical professional plugged in the iCue, they easily registered on the website and then were immediately notified if they won a new Apple iPad2. After the promotion, hundreds of customers continued to plug in for other giveaways, promotions, updated drug information, etc. 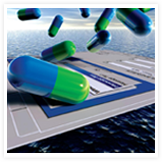 Such a buzz was created with their customers, they had to order another 5,000 units for a large pharmaceutical tradeshow. After their campaign was complete, they had increased sales within 12 months by 21.3% and were gaining valuable data on their customers that helped build their internal database for subsequent promotions.